Installation at Photoville NYC, 2017. For the third year, the New York City Municipal Archives is participating in Photoville NYC. Photoville is a two-week pop-up exhibit. This year’s venue is directly under the Brooklyn Bridge at the corner of Water and New Dock Street in Dumbo. Each Photoville participant transforms a shipping container into a temporary gallery. Our exhibit this year draws from the 150,000 photographs spanning the years 1961 to 2006 that the Archives recently accessioned from the Department of Housing Preservation & Development (HPD). Atlantic Villa, a bungalow complex in Coney Island, West 33rd Street and Surf Avenue, December 1962. Photographer unknown. 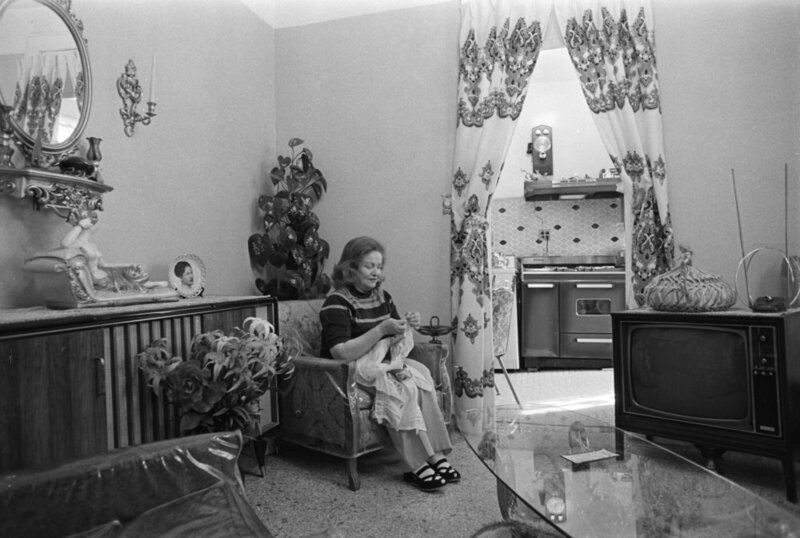 Interior of a rooming house, 143 West 47th Street, November 1966. Photograph by Paul Rice. 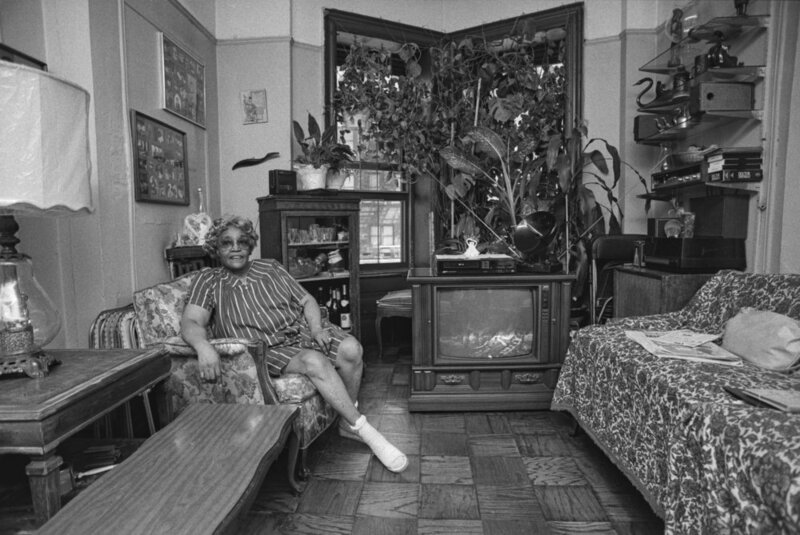 For the exhibit we focused on the four decades between the 1960s and the 1990s, a period of major swings in the City’s fortunes and housing landscape. The 59 images we chose for “Living in the City” illustrate both the human and physical aspects of these changes. In the early 1960s, much of New York looked little different from the images captured by Berenice Abbott in the 1930s for her book Changing New York. However, some neighborhoods were already being dramatically altered by massive projects. The Cross-Bronx Expressway forever transformed the Bronx landscape, and “slum-clearance” initiatives such as Lincoln Center razed the tenements of San Juan Hill in Manhattan. The Seward Park development on the Lower East Side, and Luna Park Village in Coney Island were equally transformative. Children playing on East 10th Street, between Avenue B and C, July 1966. Photograph by Paul Rice. 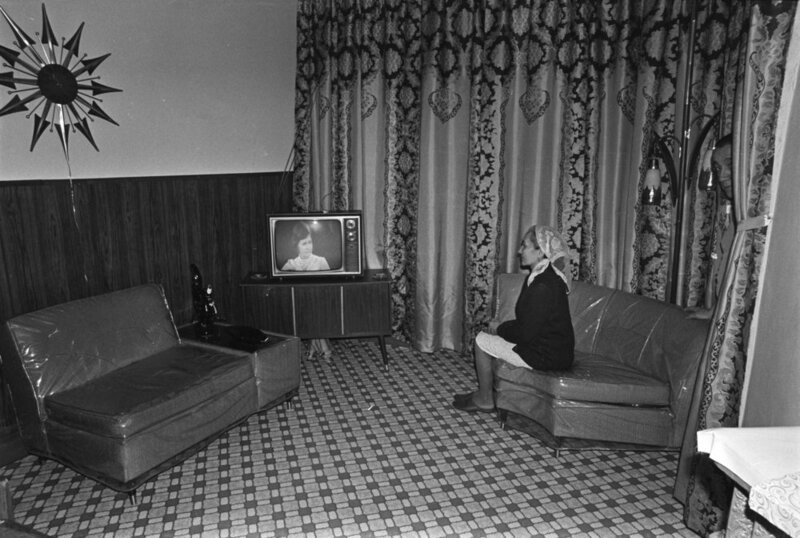 Interior of a furnished room at the Hotel Centre, 249 West 80th Street, with a female tenant and at least 10 cats, December 1966. Photograph by Paul Rice. Beginning in the 1970s, and gaining momentum through the 1980s and 1990s, HPD photographers captured the massive citywide preservation efforts that helped to restore dozens of neighborhoods devastated by abandonment and crime. Rich with images of community residents, street scenes, storefronts and advertising, the photographs in our exhibit chronicle a city in transition. This urban narrative parallels the changes in photography both technically and artistically. Early photos in the collection were shot on 4x5 film and show a distinctly modernist esthetic. Over the next several decades, the photographers transitioned to roll film and color film, and adopted a more intimate, “snapshot” esthetic. Rehabilitation completed, 665 Prospect Avenue, Longwood, Bronx, March 1973. Photograph by Leonard Boykin. Hallway in the South Bronx, 1989. Photograph by Larry Racioppo. 666 Willoughby Avenue, Brooklyn, 1989. Photograph by Larry Racioppo. The pictures tell a story of decay and renewal. But most striking to us were the informal portraits of city residents. There is an unvarnished realism in the images that is surprising—not at all the stock photography one might expect. HPD and its predecessor agencies hired talented photographers to document their programs. Larry Racioppo, a well-respected photographer still shooting in New York, was the HPD photographer from 1989 until the mid-2000s. Others include Paul Rice and Leonard “Lenny” Boykin. Ed Reed, long-time photographer for the Mayor’s Office, remembers both of them still active in the 1980s, and recalled that “Lenny” worked as a darkroom printer for the Mayor’s Office in the 1990s. Bringing the work of these talented civil servants to light is an honor. Prospect Heights, Brooklyn, 1990. Photograph by Larry Racioppo. Tire shop, location unknown, 1989. Photograph by Larry Racioppo. Installation at Photoville, NYC, 2017. Installing shows at Photoville, inside a 40-foot-long steel shipping container, in an outdoor location, in whatever humidity and weather we are dealt, is always a challenge. This year we tried something a bit different. Because the HPD images often show construction sites and empty lots, we had blue plywood construction walls installed in the container and wheat-pasted the prints to the walls, mimicking the type of street art often seen on similar walls. We added a few flourishes such as a spray-painted “post no bills” notice and a cutout window looking in on a construction site. We learned to embrace the imperfection of the wheat-paste method, and by the end of the two weeks, the prints will have curled and frayed somewhat—just like posters glued to construction fencing. However, the more imperfect, the more authentic and on Monday the walls will come down and the containers will ship out until next year. Dry cleaner, West 140th Street, Harlem, 1994. Photograph by Larry Racioppo. Tenant in window, location unknown,1996. Photograph by Larry Racioppo. As the largest municipal housing agency in the nation, HPD promotes the construction and preservation of affordable, high-quality housing for low- and moderate-income New Yorkers, enforces the Housing Maintenance Code to ensure the quality and safety of the city’s housing stock, and engages in comprehensive planning to strengthen neighborhoods across the five boroughs. Thanks to funding from the Local Government Records Management Improvement Fund the photos have been catalogued and rehoused and more than 10,000 have been digitized.